​For those of you who follow baseball - the Milwaukee Brewers in particular - Brookfield East girls swimming coach Michael Rose has his own version of Hernan Perez. Perez is the Brewers utility man, a player so multi-talented that he is too valuable to play only one position. This past season Perez played every position but catcher for the Brewers and was a key part of their success. Junior Zoe Woods is the equivalent of Perez on the Spartans swimming team. Woods made it to state in the 100 freestyle and 100 backstroke and was part of the 200 medley relay and the 400 freestyle relay teams as a sophomore. She also swims the 200 free and 50 free and she is a state level 100 butterfly swimmer. "She's my utility player," Rose said. "She has swum pretty much every event since she's been here. We'll put her in odd positions. Last night she swam the 200 medley relay and then came back and swam the 200 free. The week before she swam the 200 free relay, the 100 back, the 400 free relay, swimming three of four events and anchored our relays there. "She's just super competitive and willing to do whatever we need her to do. She isn't afraid to race (against some of the best swimmers in the area). She gets upset when she loses - she's very competitive - but a lot of times that's kind of the person you want on your relays and stuff. "It's not the person who always wants to win - it's the person that never wants to lose. She's willing to do whatever and she can do whatever. Right now she has to decide what races he's most comfortable in. She should qualify in whatever events she swims. She tapers really well." Last weekend (Oct. 28) at the Greater Metro Conference meet, Zoe won the 200 freestyle in 1:57.50 which is quite a good, untapered time. She was also third in the 100 backstroke at 100.9 which is also good. It was a very tight race." Photo by Al Herzberg, SportsPhotosLLC --- Brookfield East junior Zoe Woods is the Spartans version of baseball's utility player, taking part in several individual events and acnhoring the relay teams. The Spartans open the sectional on Saturday, Nov. 4, - the diving event is on Friday, Nov. 3 - at Waukesha South/Mukwonago and swimming is the next day. State is set for the following weekend, Nov. 10-11, at the UW Natatorium in Madison. Zoe shared her thoughts on swimming in several events over her career. "I like the 200 free and I haven't swam that the past two years," she said. "I think that's my favorite now. I've always liked the backstroke, but lately I've grown out of it. I do like freestyle a lot now. I like sprints." Rose has Woods anchoring some of the relays and she talked about the responsibility that puts on her. "It's kind of scary if it's close, but I like it," she said. "There's a lot of pressure but you want to impress people at the same time. He (Rose) has a lot of faith in me. I can bring home the relays. When it's close, all the adrenaline is pumping and you just go faster." Zoe talked about the different mindset when being on the relay team. "For relays they're definitely more fun because it's a team effort," she said. "I have a different view on the race. You don't want to let the other people down, so everyone's together. "As an individual it's all you. If you end up doing not so well (in individual races), it's all on you. If you do well it's just for you to celebrate." 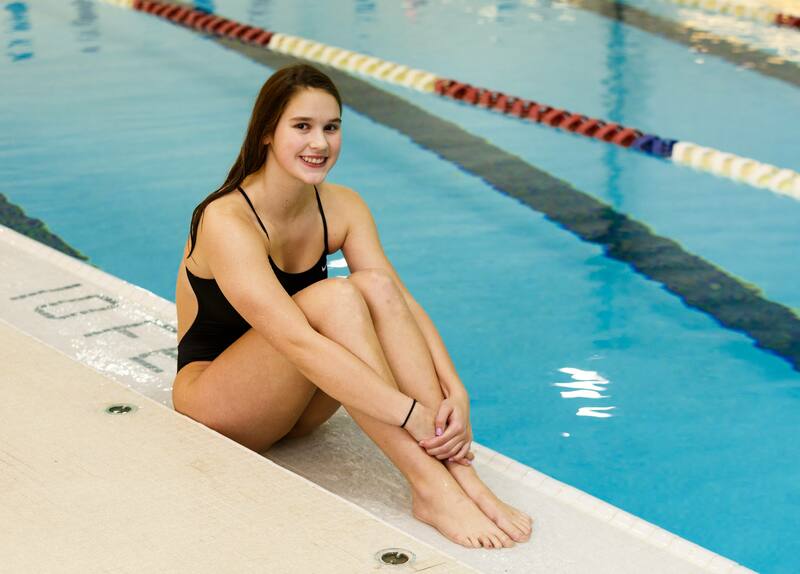 Zoe first got into recreational swimming in third grade in Pennsylvania before moving here when she was 5 years old and joined the Elmbrook Swim Club. "I met a lot of friends and practice was really fun for me," she recalled. "I used to like dance too. Then I got my first state qualification - that's when I got serious about swimming. Then over the year I've had more accomplishments." Rose actually coached Zoe before high school with the Elmbrook Swim Club, so he knew what was coming. "I coached Zoe when she was 8-9 years old at Elmbrook - she stood out even then as she has great underwater ankle flexibility," he said. "She was good at dives and streamling stuff. "Kids like that stand out because they are so much better when they hit the water. Even if they don't do anything, they just dive in and blow past everybody. She was with me only for a year and she was talented enough that she moved up right away by the time she was 11. "When they are little, they tend to get really good, really fast. She was never going to be a super big girl, so she was going to keep a swimmers physique. The feel for the water and the underwater stuff she had was an unusual talent for a little kid. She was just comfortable in the water and she managed it very well." Photo by Al Herzberg, SportsPhoto LLC --- Zoe Woods finished first in the 100 freestyle and third in the 100 backstroke. Rose then continued to talk about her strength and what she needs to work on. "She is really strong, which is great for underwater. She swims really strong, very powerful. If you watch her when she dives, she has incredibly flexible ankles. Swimmers are allowed to swim 15 meters underwater. The fastest swimmers use it all. Zoe is very fast." With the post-season before year as well as her senior year, Rose talked about what she has to work on - which wasn't much. "She has to just keep working like she has been working," he said. "She can get down on herself or get disappointed if things don't go perfectly, but this year's been better. She stays happy all the time. This has been a really happy season for her. She's been really upbeat." Zoe also talked about her strengths and what she needs to work on and she was a little more critical of herself than Rose was. "My underwater streamlining is really my strength. I streamline underwater almost 15 meters," she said. "While some people have already started swimming, I'm underwater still kicking. My first stroke is like their fifth stroke. "But I have to work on my reaction time for starts. I'm a little slow on that. Also believing in myself that I can do it. Sometimes I doubt myself when I'm on the blocks. I need to work on having a positive attitude toward every race." Although he is not a captain this year, Zoe has her own ideas about leadership. 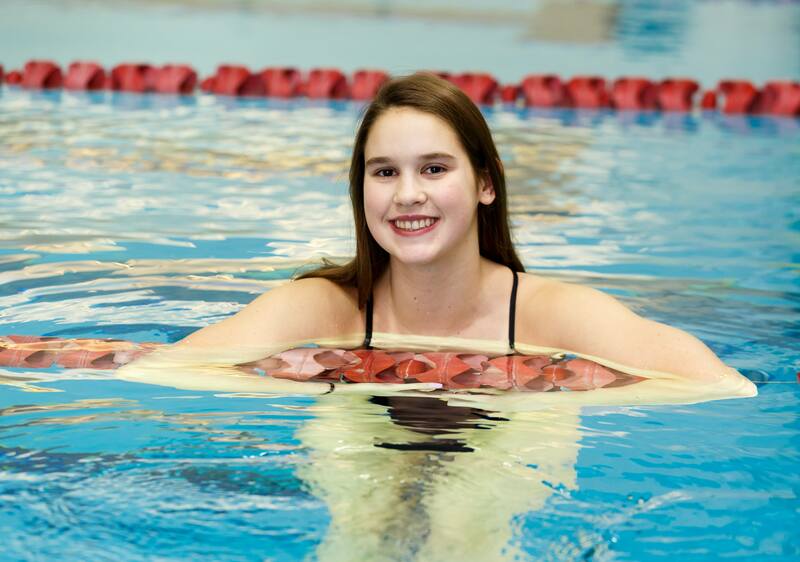 "Because I am one of the better swimmers on the team, the JV girls kind of know who I am," she said. "They see me during the meet. I try to be nice to them. I will give them advice. I go to them or they come to me. I like to be nice to everyone on team, cheering for everyone, caring for everyone, leading cheers." One of the things she learned was making sure the JV girls felt included. "I learned that we need to include everyone," she said. "Sometimes they don't come to our carbo crams because their meet is at the same time or because they don't know anyone. As a team in the future we need to work on bonding, everyone together, to be friends, know each other." Rose has seen Zoe improve her leadership skills. "I think she's grown as a leader," he said. "She takes a while to get to know because overall she's pretty quiet. I think she's more outgoing with the kids. Since she was a little kid, my experience with her with me and other adults who coached her was she was pretty quiet. "I've had her in class, she sits by me and we're spent quite a bit of time talking and I'm getting to know her much better. I think she's loosening up that way. She's a really good 'in the pool' leader more than anything. She leads by example, how she swims, how hard she works." Since neither of her parents (Jim and Kris) swam, Zoe is surprised by her success. "So it's kind of shocking for me that I've had the natural talent for that." MOST MEMORABLE MOMENT: ​Set a record in the 200 medley relay at sectional.